"We have had access to blood tests from a quarter of a million Copenhageners. We found higher mortality in people with a low level of vitamin D in their blood, but to our surprise, we also found it in people with a high level of vitamin D. We can draw a graph showing that perhaps it is harmful with too little and too much vitamin D," explains Darshana Durup, PhD student. "We have moved into a controversial area that stirs up strong feelings just like debates on global warming and research on nutrition. But our results are based on a quarter of a million blood tests and provide an interesting starting point for further research." "Our data material covers a wide age range. The people who participated had approached their own general practitioners for a variety of reasons and had had the vitamin D level in their bloodstream measured in that context. This means that while the study can show a possible association between mortality and a high level of vitamin D, we cannot as yet explain the higher risk," explains Darshana Durup. 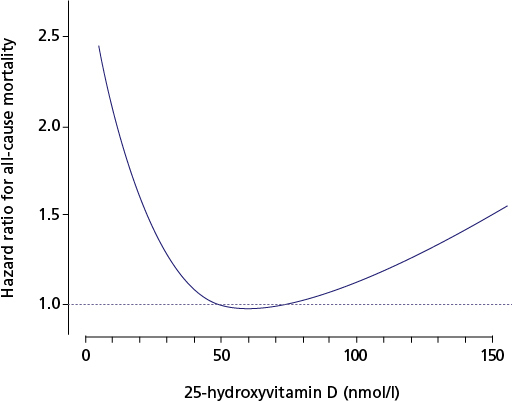 Scientists have measured 25-hydroxyvitamin D (in nanomol per liter of serum). The study’s conclusion: If the blood contains more than 140 nmol vitamin per liter of serum, the mortality rate is higher by a factor of 1.42. However, the mortality rate is higher by a factor of 2.31, if the blood contains less than 10 nmol vitamin per liter of serum. Both figures are considered in relation to 50 nmol vitamin per liter of serum, where scientists found the lowest level of mortality risk. Because the risk is slightly higher with a low level of vitamin D, scientists can draw a so-called reverse j-shaped curve. If the risk of mortality were the same on both sides of normal, the curve would be U-shaped. The ordinary Dane gets 1/5 of his or her need for vitamin D covered by diet and 4/5 by sunlight. Vitamin D is created in the skin. However, in the period from October to March, the sun is low in the sky in Denmark, providing insufficient light for initiating vitamin D production in the skin. Therefore diet and vitamin D supplements are particularly important as sources of vitamin D in the winter months. The Danish Health and Medicines Authority recommend a daily intake of 7.5 µg of vitamin D. Most Danes get 2-4 µg of vitamin D from diet. With the exception of some types of mushrooms, only animal food products contain vitamin D (fish, meat, eggs, dairy products). It is recommended to eat 200-300 g of fish per week. Fatty fish is particularly rich in vitamin D.
It is very important for vegans and vegetarians to follow the advice above regarding sunlight and possibly to take vitamin D supplements in the winter months.